This year, I received an instant pot for Christmas. I had been hearing from EVERYONE about this magical pot, but never took the time to go out and get one. I figured my slow cooker and stove top cooking got me this far, so why bother? But then Christmas rolled around and mom came to the rescue with an instant pot for those nights where you know dinner just isn’t going to happen on time. I’m not gonna lie. At first, I found the instant pot to be a little intimidating because I couldn’t even get the lid on. Good start. But once I mastered that important step, it wasn’t all that difficult to figure out. Just push a few buttons, push a little lever at the top. Boom, you’re good. I had an urge to make a soup since it’s been so freakin’ cold outside and it seemed like the perfect comforting thing to have on a snowy winter day. 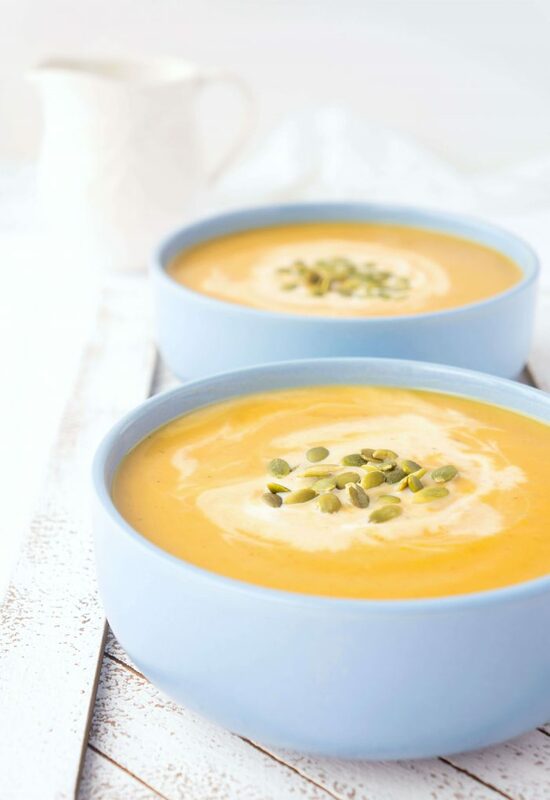 So out came the magic pot to form some of this super easy Instant Pot Curried Butternut Squash Soup. It was smooth and velvety with just the right amount of spice and literally took no time at all to prepare, which is always a huge win in my books! In order to master the instant pot, however, it’s important to pay attention to a few key steps! First, you’ll want to plug the instant pot in and turn it onto the “saute” setting. Once the pot has heated up, add the oil, diced onion, celery and garlic and allow to cook for about 4-5 minutes until fragrant, stirring every minute or so to prevent sticking. Add the curry paste, stir and cook for another minute. Next, press “cancel” and turn the instant pot onto the “pressure cooker” setting. Add the diced butternut squash and the broth and give it a quick stir to combine all of the ingredients. 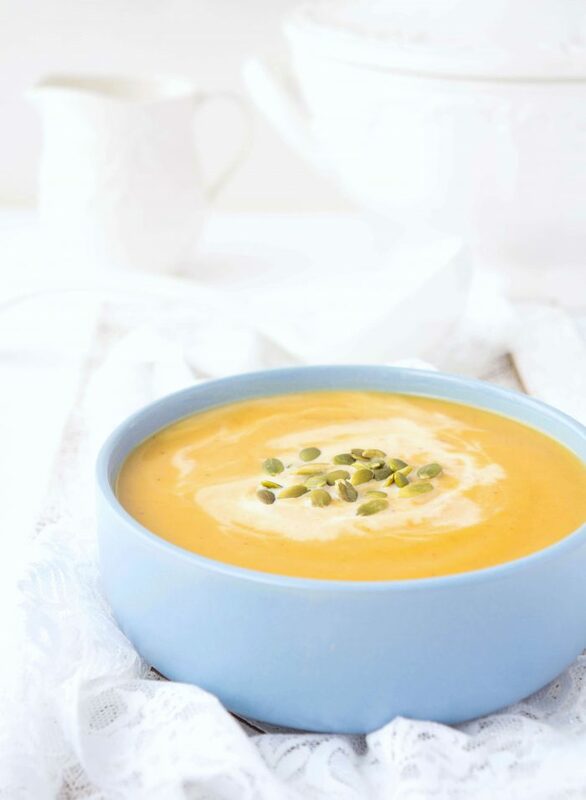 I tried this soup with both a large fresh butternut squash and frozen diced butternut squash and it worked well both times. By using the frozen, it makes it SUPER EASY because you don’t have to worry about chopping the squash and digging out the seeds, which I don’t particularly enjoy. Press the “soup” setting and allow the soup to cook. This should take around a half an hour or so. This is the part where you can go off and do whatever the heck you want because the pot is doing all of the work for you! Remove the lid once the soup is done venting. Allow to cool for several minutes. Using an immersion blender, blend all of the chunks until smooth. 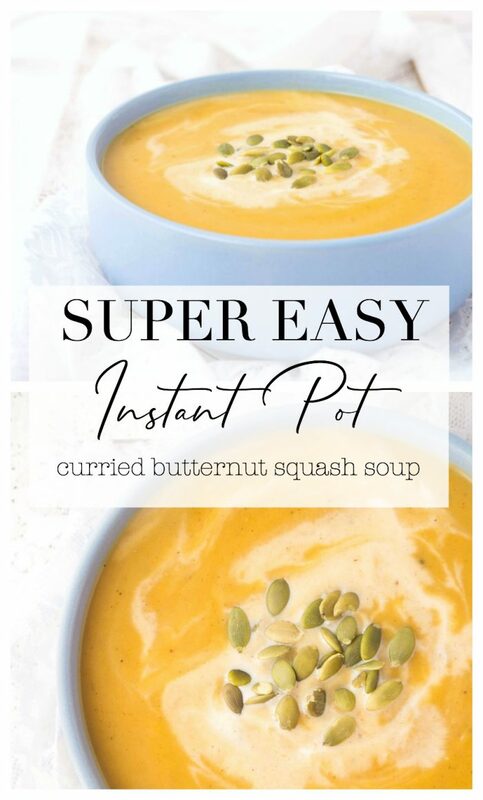 You can also transfer the soup to a blender in batches to accomplish this, but believe me, along with the instant pot, the immersion blender will be your new best friend. It makes life SO much easier! Next, add the coconut milk and blend. You may also wish to add more broth at this point depending on how thick or thin you like your soup. Season with salt and pepper to taste and serve. Serve topped with Roasted Sriracha Chickpeas and a side of Roasted Turmeric Cauliflower to make it more of a complete meal with the additional veggies and protein. The chickpeas add a nice spicy kick that compliments the flavour of the soup really nicely. 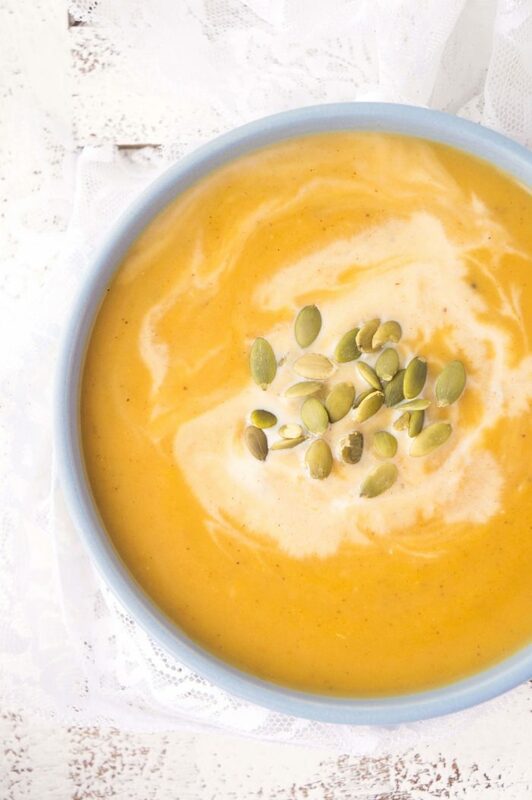 Top soup with an extra drizzle of coconut milk and roasted pumpkin seeds. Serve as a side along with a wrap or sandwich. Try out this Vegan Rainbow Falafel Wrap for a flavourful and filling meatless meal! For babies or young children, you can also use this soup as a sauce and mix it in with noodles, diced chicken or steamed veggies to add some extra flavour and make it easier for them to chew and swallow. I’ve been doing this with our little guy and he’s practically licking the bowl every time. 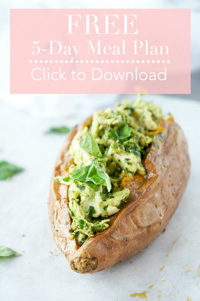 It’s a great way to sneak in some extra veggies into the day too! Once you start using the instant pot, there’s no turning back! 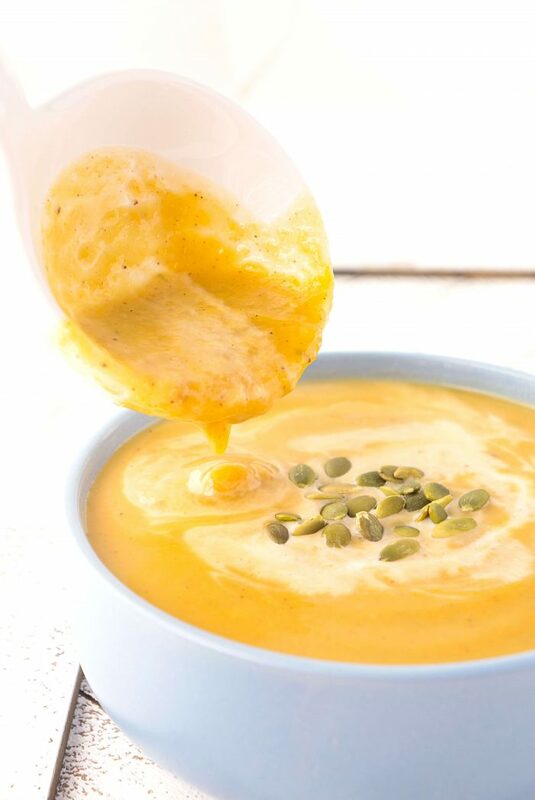 Especially when you discover super easy recipes like this curried butternut squash soup! Turn instant pot on to sauté setting. Add olive oil to pot. Saute onion, celery and garlic for 4-5 minutes until fragrant. Add curry paste and stir. Cook for an additional minute. Press cancel and then turn on the pressure cooker setting. Add butternut squash and broth. Lock lid in place and put instant pot on soup setting (it should cook for about 30 minutes or so on high pressure). Once done, allow the pressure to naturally release. If in a rush, you can also do quick release following the instructions in the manual (or refer to tips above). Open lid, using an immersion blender, blend until smooth. You can also transfer to a regular blender and blend the soup in batches. Season with salt and pepper to taste. 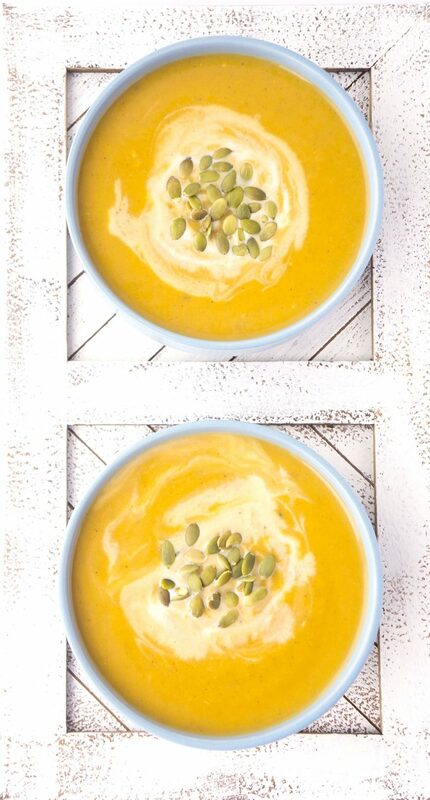 Serve topped with roasted pumpkin seeds or see other serving suggestions above!